To reduce compatibility questions, Microsoft has a new name for universal apps that will work across multiple screen sizes: Windows apps. Windows apps will work on Windows 10 laptops, tablets, desktops, phones, IoT and Xbox. "In Windows 10, we have this notion of a universal app platform," Microsoft engineer Don Box said in a session at WinHEC 2015. "And the apps that target it are called Windows apps. Sometimes we say universal apps, but we call them Windows apps." Box goes on to detail that Windows app can run "on every device family: phone, PCs, Xbox, IoT, and other devices like HoloLens." With Windows apps, Microsoft is changing the branding of its universal apps away from Modern apps and Metro apps that are found on Windows 8.1 and Windows Phone 8.1. By calling universal apps Windows apps, Microsoft appears to be moving to a centralized Windows 10 branding. Additionally, Windows 10 PCs will continue to support legacy Win32 apps. Those apps will not be called Windows apps as they won't work on Windows 10 for phones, for example. These legacy Win32 apps will be called Windows desktop apps. "On PCs, we continue to support the two decades-plus worth of Windows desktop applications…for running them on PCs," Box said. "So sometimes we will talk about a Windows app [what we have been calling universal apps to date] and Windows desktop apps. 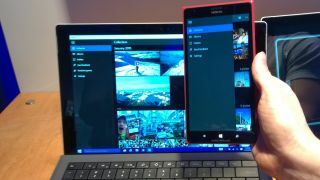 Windows apps run on all devices. Windows desktop apps [are] PC only." Aside from branding, Microsoft's strategy with desktop apps and Windows apps has not changed. "Microsoft expects developers to create new Windows apps, not new Windows desktop applications," Paul Thurrott wrote on his site. "And it has improved the Windows universal app platform - which is really just a refinement of Metro...to make it more powerful and capable."